History will remember only a few names in the entire aviation history... Burt Rutan will be one of them. 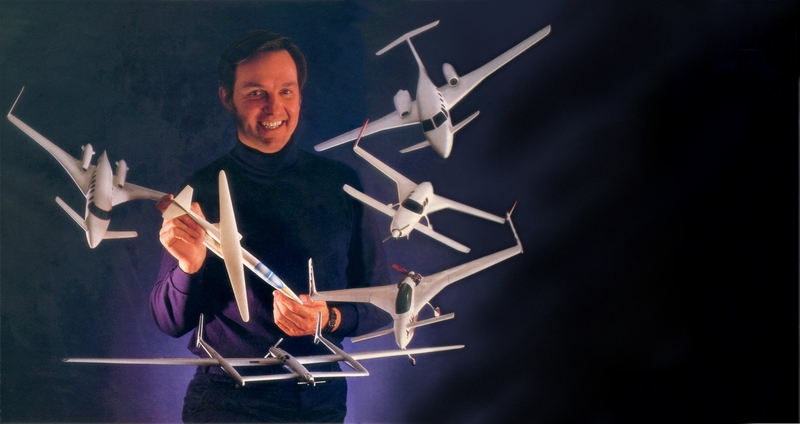 If one tried to measure Burt Rutan's success by the number of airframes that he built, his work would probably be a mere footnote in aviation history. However, if we look at how influential he was to the progress of general aviation, to the development of advanced composite construction and to the evolution of aircraft design in both civilian and military aircraft, Burt Rutan undoubtedly stands out as one of the top guys in the field and one of the very few true visionaires of the 20th century and beyond, being named to Time magazine's list of the 100 Most Influential People in the World in 2005. After graduating from the famous Cal Poly in 1965, Elbert "Burt" Leander Rutan worked for the U.S. Air Force until 1972 as Flight Test Project Engineer at Edwards AFB. After a stint as director of the Bede Test Center for Bede Aircraft in Newton, Kansas, Burt resigned, moved his family to Mojave, and started Rutan Aircraft Factory (RAF) in order to develop a non-conventional research aircraft he had designed while still in college, the VariViggen. A long string of incredibly innovative and highly unorthodox designs ensued, marketed in plan form to many private builders. Rutan fathered the VariViggen, Quickie, Defiant and above all the highly successful VariEze and Long-EZ which single-handedly started the trend for canard configuration in private planes. Rutan is also behind a series of remarkable world records: the Voyager, the AmsOil Racer, the Virgin GlobalFlyer, the Global Hilton gondola, but above all the first civil spaceship ever, the Anzani X-Prize winner SpaceShipOne. In 1982, Rutan set up Scaled Composites, a Mojave-based company serving as a think tank and a builder of prototypes for major industry players and smaller startup companies alike. Scaled has been involved at various levels in many key programs such as the B-2 bomber, the Beechcraft Starship, the Northrop Grumman X-47, NASA's X-38 and others too numerous to mention. Scaled has now become an integral part of Northrop Grumman and Burt Rutan is now officially retired, but no doubt his innovative spirit will live on within the company and beyond.